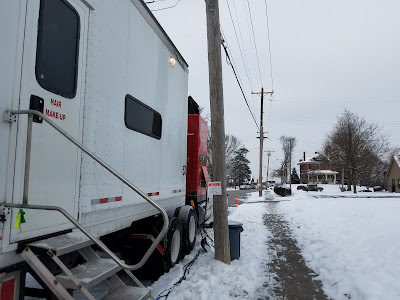 A trailer is now parked on N. Fort Thomas Ave. in preparation for film shooting, which is expected to begin tomorrow. Photo courtesy of Jeremy Shannon. Shooting in Fort Thomas for the upcoming feature film "Extremely Wicked, Shockingly Evil and Vile," a biopic about serial killer Ted Bundy, begins today. Students involved with Highlands High School's Filmmaking and Broadcasting Department are thrilled. And First Baptist Church, close to HHS on N. Fort Thomas Ave., will be at the heart of it all. The film, which will be told from the viewpoint of Bundy's then-girlfriend, Elizabeth Kloepfer, will feature Zac Efron and Lily Collins. 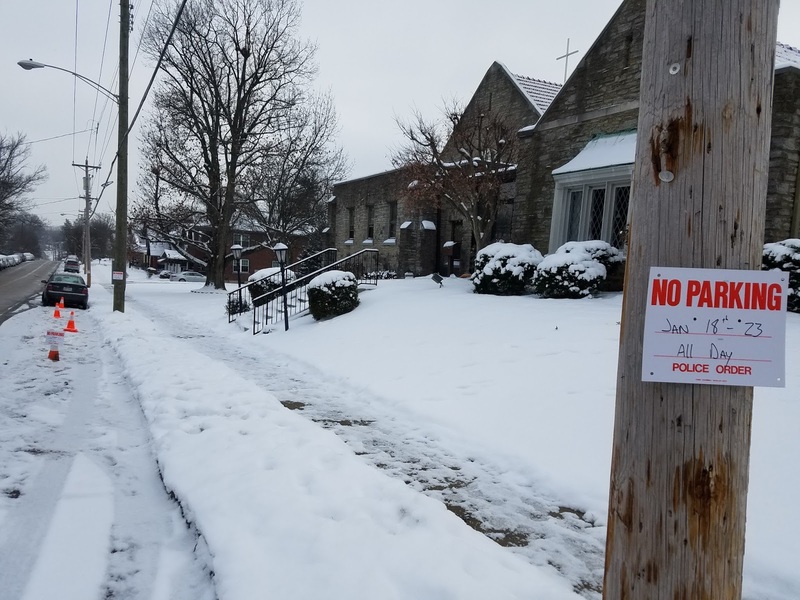 "No parking" signs are now up on one side of N. Fort Thomas Ave. Photo courtesy of Jeremy Shannon. "No parking by police order" signs have been hung up on one side of N. Fort Thomas Ave., indicating no parking all day from January 18 through the 23. In addition, the film crew will be using First Baptist Church's parking lot during this time. "We have tried really hard and we really want to be good neighbors," says Jeremy Shannon, First Baptist Church's new pastor. "We think the benefits of what is happening is good enough for the community and it's just a couple days inconvenience." Film crews will be using the parking lot, fellowship hall and kitchen at First Baptist Church in Fort Thomas. Photo courtesy of Jeremy Shannon. In addition to using the church's lot, the film crew will be using the fellowship hall in First Baptist Church to serve meals to the crew. A caterer will be present, as well as a food truck. 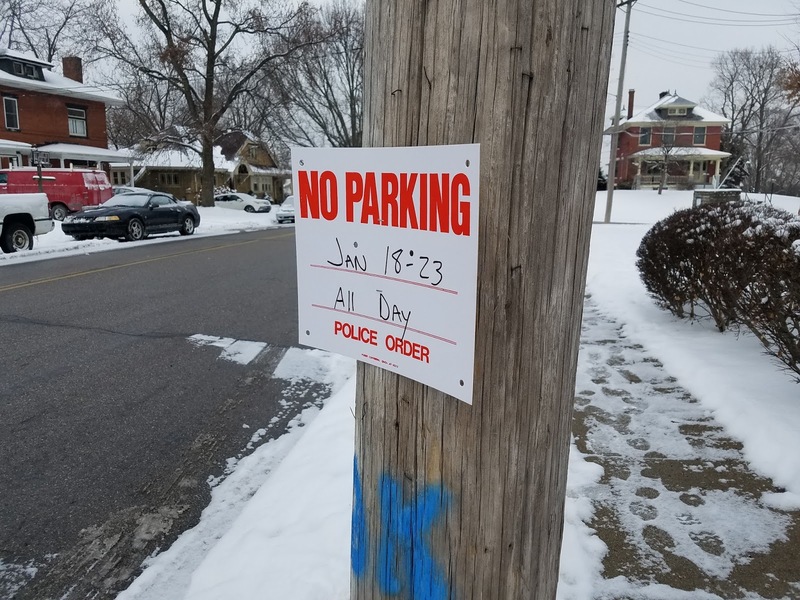 The church's lot and surrounding space on N. Fort Thomas Ave. will also be used to shuttle actors, actresses and crew to Woodside Place, a street in which parking is already at a premium. There they will be filming scenes in a house that looks like it's straight out of the 1970s. (According to Shannon, a younger couple purchased the house because of its 1970s style and they're thrilled it's going to be used in the movie.) In addition to flyers being sent out residents on Woodside Place were invited to town-hall-like meeting to discuss logistics. 18 N. Fort Thomas Ave, in The Hiland Building. First Baptist Church will also have a starring role in the film. According to Shannon, when crew came to scout out the church's lot in terms of having space to set up trailers and the like, they realized that the exterior of the church adjacent to the parking lot looks very much like one of the buildings they wanted to film. "One night they're going to do a scene at our church," Shannon says. "I don't know the full story of Ted Bundy but apparently he escaped an administrative building, a small-town little jail – not a maximum-security jail – with a jailor's house next to it. The back of our church looks like the building, which I thought was funny. They'll be digitally altering it because the film is set in Colorado. But if you live in the community, you might recognize the church." Shannon says the crew has been kind in terms of sharing information and inviting folks who are affected to participate. Shannon says location managers, in particular, typically are local and want to build good community relationships. Students who participate in the HHS Film and Broadcasting Department are especially keen to take advantage of the filming taking place in Fort Thomas. "We've been reaching out to various people involved in the production over the past few weeks in an attempt to get interviews with any of the production staff and cast – especially Zac Efron," says HHS student Sam Lohner who, along with HHS student Kat Finseth, started a small Twitter campaign to get Efron's attention. A recent Tweet says "We heard you're going to be in the neighborhood for 'Extremely Wicked, Shockingly Vile and Evil.' We'd love to have you visit @FTSchools in Ft. Thomas, KY. We are high school filmmakers and broadcasters who would love to have you stop by and talk to us! @ZacEfron." While they hope to set up additional interviews, students in the HHS Film and Broadcasting Department will be going to lunch with some of the staff. "We are very excited for this opportunity to explore the production elements of a film, and get some insights from people working in the field," Lohner says. Photo courtesy of Jeremy Shannon. Filming is slated to start today, and will continue Friday and Saturday, pushing through until early morning Sunday. Churchgoers will be permitted to park in the church's lot for Sunday services. The crew will take two days off and then will film for a day or two more before departing. Shannon and his wife, Jenni, are both Kentucky natives but most recently lived in Memphis. 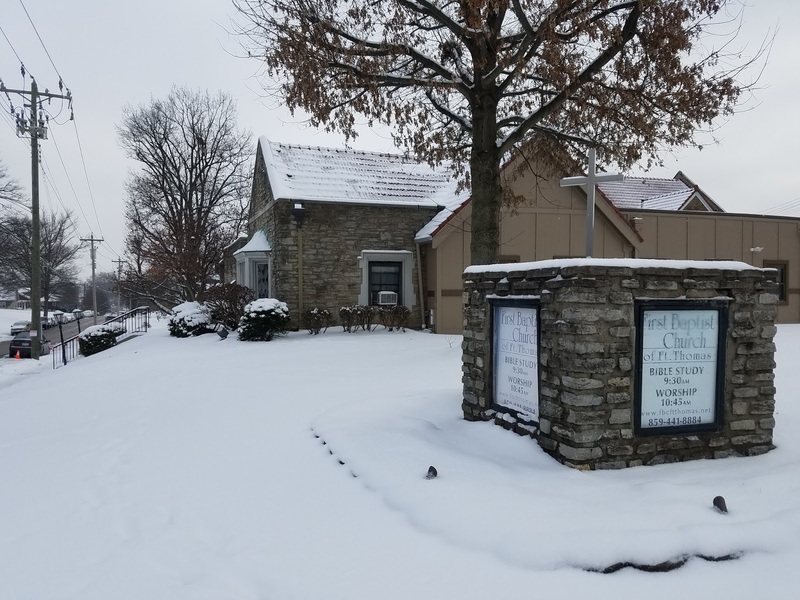 They received a call about the First Baptist Church pastor position in the first week of December, and moved to Fort Thomas right before Christmas. They have an almost-2-year-old daughter (named Crosley – they are huge Reds fans) and twin boys on the way. Shannon says that although the film crews will be present at First Baptist Church, he'll still be at the church daily, and that anyone who needs to get in contact with him or First Baptist Church still can. "We're still open for business," he says. For Shannon, he says that while the filming may be inconvenient for a short time, he believes the long-term impact will be good. "The way we look at it is that it's a way to embrace the people coming into our property," he says. "They're going to be in the church for a couple days. So we're going to welcome them and try to look at this as an opportunity. I believe it's not a coincidence and that good can come from it." "This is an amazing opportunity, for the whole town and especially for our program," Lohner says. "The film, drama and arts programs at HHS could greatly benefit from interviews with the crew and cast, which is why we have been working so hard on this project." Call Ashley Barlow for all your legal needs. 859-781-5777. This is an advertisement. Have a spare moment? Head over to @broadcastinghhs and share their tweet. Because while not everyone is happy with the "no parking signs," there are quite a few residents who are thrilled to have Hollywood in town, and quite a few students who are hoping for some educational insight on the filmmaking process, direct from the source. Highlands Middle School Presents Peter Pan Jr.